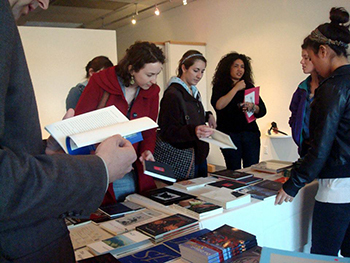 Customers browse at the Poetry Book Fair in 2012. In collaboration with the YMCA’s Downtown Writer’s Center, Point of Contact Gallery is hosting its third Poetry Book Fair to showcase books by poets from central New York. This is an opportunity for local poets to showcase and sell their published work. Part of Cruel April, an annual poetry event presented by Point of Contact, the Poetry Book Fair will kick off April 3 and continue throughout the month. Poetry books will be left on display at the gallery during poetry events throughout the month and are available for purchase. Poets interested in having their published work showcased at the Poetry Book Fair should contact the Point of Contact Gallery by March 25. For more information about the poetry events during Cruel April, or to register for the Poetry Book Fair, contact Point of Contact’s managing director Miranda Traudt.